Make reading more of a game with this Bubble Word Families Sorting Activity from Kindergarten Worksheets and Games! Included in this Bubble Word Families resource are 13 word family mats as well as over 52 bubble image cards! Print in color to be able to reuse the activity and make it more fun! Each page has a bottle of bubbles with an image and word. Your child has to match the bubble image cards with the sound on the bottle of bubbles! It’s a fun way to practice word sounds and reading! 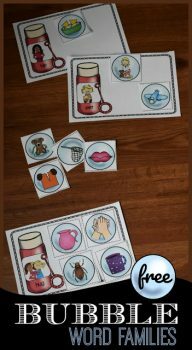 Get the Bubble Word Families Sorting Activity today!